The Rhino Collision Arms of Steel bag has been specifically designed to isolate accurate bodyheight. Training with the Arms of Steel bag helps you with accurate body height, reaction speed and balance. The bag contains an inner core steel tube which is embedded within the foam casing. This inner core tube is filled with a fine sand which simulates inner movement within the tube when contact on the bag is carried out. Due to the reaction of the sand within the core, if the bag is not gripped properly with a strong arm clamp, the player will lose control of the bag. 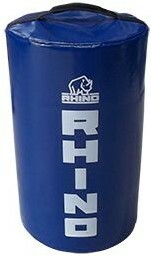 The Rhino Collision Arms of Steel Bag is part of the Collision Technical Range and can be used in isolation or as part of the full Collision Range.